Choosing the best eCommerce builder is similar to picking a candy from a pack. You never know which one tastes better: milk chocolate with nuts or dark with strawberry. In this review we are going to compare Squarespace vs Shopify - two leading shopping carts nowadays, and help you to find out which filling you would love more. eCommerce Builder or Website Builder? The question is tricky, because you already know that most of modern platforms offer a set of eCommerce features. The answer lies in primary purposes of Squarespace and Shopify. Squarespace is a website builder, it was initially presented as a portfolio and blogging platform, designed to build and maintain content-based websites. ECommerce possibilities have been added only recently, and, unfortunately, they are quite limited; now, Squarespace allows you to sell products after connecting the payment processor. Shopify is a “pure” eCommerce builder (shopping cart), exclusively created to run web stores. Naturally, it offers more advanced and comprehensive eCommerce and tools suits better for establishing an online retailer. To choose the “candy” you would love, firstly come up with a decision what you are looking for: a thoroughly designed, dynamic website with basic online store functionality, or a flexible, advanced shopping cart, focused on eCommerce with basic content management functionality?? Squarespace vs Shopify. What’s In Common? Both Squarespace and Shopify are hosted platforms that enable you to run your site quickly and easily. To start, you need only to sign up, and you’ll never have to worry about updates. Hosted platforms are simple to manage and provide you with hosting and technical support for a monthly fee. Both Squarespace and Shopify offer basic tools and features needed to create a good online store. That said, Shopify has much more to offer to make it more functional e.g. the support of redeemable gift cards, vouchers or certificates - essential part of successful eCommerce marketing efforts. No matter what platform you choose, Squarespace of Shopify, both of them offer a lot of beautifully and skilfully designed, responsive themes. Shopify wins a point, by having more than 100 free themes. In contrast, Squarespace offers 25 free templates only. Moreover, Shopify gives you full control over HTML and CSS of your site, and Squarespace allows editing CSS and certain bits of HTML only. It’s a pity that Squarespace support team reserves the right not to sustain you fully if you edited CSS to your website. While Shopify templates are stylish, elegant and more customizable, many users express a thought that aesthetically (which is quite subjective though) Squarespace templates are more appealing. Luckily, both Squarespace and Shopify offer higher than average SEO capabilities. But, if we compare Squarespace vs Shopify SEO score, according to eCommerce platforms research, Shopify is a total winner, after Magento. Considering that both solutions are hosted, we can admit that these two platforms are user-friendly and simple to start with even for newbies. Their interfaces look clean, organized and easy to navigate. Squarespace along with Shopify have integrated blogging functionality - a handy tool for eCommerce stores nowadays. Experienced marketers and store owners are aware of the benefits a qualitative blog can give them in terms of SEO and customer engagement. Squarespace vs Shopify. What Are The Key Differences? Shopify is eCommerce - oriented, unlike Squarespace which is also focused on building non-eCommerce sites. This noticeable difference should not be disregarded when you are choosing a platform for retail. In case you are using Squarespace for running online store, we suggest you to migrate to Shopify. Shopify offers 24/7 responsive support and assistance though main channels - phone, email, live chat. Squarespace comparing to Shopify support misses some points. You can reach them via email or live chat, and live chats are available only from 3 a.m. to 8 p.m., from Monday to Friday. There is no phone support offered to customers. Frankly speaking, Shopify has considerably higher prices than Squarespace. The main reason for this is that Shopify provides more advanced and comprehensive eCommerce tools in comparison with Squarespace. Shopify also has a lower-priced Shopify Lite plan, which you can subscribe for if you already have a website or webstore on other platform. All plans have the eCommerce integration, however, the Basic and Advanced plans offer more advanced features. The difference between monthly plans pricing is noticeable, but keep in your mind that Shopify provides more tools to build a progressive eCommerce store and offers you 24/7 responsive support. Shopify has the very large App Store with over 1 400 apps to power your store and add more functions to it. Shopify offers many SEO and marketing apps, modules to facilitate store management and integrations with different services. Shopify also has its own official iPad app to accept payments from Visa, Mastercard, and American Express and update your stock in real time. Squarespace doesn’t have it’s own app store, but there's a number of a third-party plugin market for Squarespace popping here and there. The problem is that not all Squarespace users want to risk the safety of their websites by using apps that are not officially proved by Squarespace itself. Shopify allows you to accept payments from almost anywhere and in most currencies. It enables you to use more than 70 different payment gateways, including most popular method - PayPal. Strangely enough, until December 2016, Squarespace worked with a single payment gateway - Stripe. Stripe is just one of the many that Shopify does offer to its users, taking in mind that each seller is unique and should have a choice. Luckily, Squarespace recently introduced integration with PayPal, that opens many new possibilities to store owners. It is very promising that Squarespace slowly widens its range of payment methods. 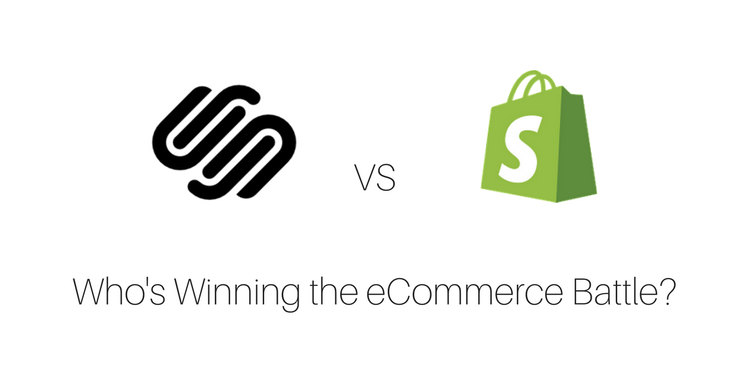 If to compare Shopify vs Squarespace, the latter one has no chances to win in this race. What are Advantages of Squarespace over Shopify? If you aim to showcase content, particularly images or personal blog, Squarespace is more subtle and flexible solution than Shopify. The quality of Squarespace templates is higher than in Shopify, they look more clear and elegant.A lot of Squarespace templates are created for those, who want to blog or showcase music portfolio, art or photography. Depending on the chosen template, you'll get many awesome visual effects in play, including parallax scrolling and text that gracefully fades in and out when users scroll through a site. Squarespace's partnership with Typekit makes more than 65 Typekit fonts available to Squarespace customers for no fee. Print types are important factors that influence on customer’s brand perception. Another partner of Squarespace is Getty Images - one of the world's leading creators and distributors of high-quality images and videos. Thanks to this partnership, Squarespace website owners get an exclusive rate for using images from Getty on their websites, at the affordable cost of $10 per photo. Squarespace provides you with Style Editor tool to customize your website without typing any codes. It is exceptionally easy to use even for non-technical person. With the help of Style Editor you can adjust colours, background images, typography, opacity of images, the width of the sidebar, any spacing and padding, and page-specific styles. What are Advantages of Shopify over Squarespace? One of stunning features, offered by Shopify, and not currently provided by Squarespace, is “Point of sale” (POS) complement. This software works both for IOS and Android systems and allows you to integrate online stores with physically located shops seamlessly. POS feature comprises a card reader, barcode scanner, cash drawer and receipt printer and gives you a possibility to sell anywhere, keeping your stock count synced automatically. Value Added Tax (VAT) is consumption tax in Europe that has to be charged at the rate according to customer’s country. Due to the Automatic calculation of EU VAT, Shopify store owners could save hours and hours and sell products straightforward to European Union countries with no troubles. In Squarespace, Value Added Taxes have to be entered manually as individual “tax rates”, which takes lots of time to keep the up to date always. Offering gift cards and discount codes is not only a good way to boost your store performance, but it’s a great way to involve more audiences to your site. Customers are tend to send gifts to family or friends and, probably, will buy gifts from your store if a gift card option is available more frequently. Unlike Squarespace, which doesn't support redeemable gift cards, gift certificates or vouchers at this time, Shopify offers to its merchants all these as well as discount codes and coupons. Recently, Shopify has integrated with the world’s eCommerce giant Amazon. Now Shopify store owners are able to add Amazon as a Sales Channel, create Amazon listings from existing products and fulfill orders directly from a single Shopify Admin Panel as well as link Amazon listings to your Shopify store. This awaited Shopify-Amazon integration aims to connect enormous Shopify merchants base with “millions of potential Amazon customers”, grow sales extremely by augment of new audiences. Shopify is also integrated with Facebook, where customers can easily browse your products using new Shop section on Facebook. Moreover, Shopify has partnered with Pinterest, and now store owner can sell products to millions of Pinterest users. All the products pinned from Shopify online store will become Buyable Pins automatically on Pinterest. Shopify “Buy Button” is the simplest way to add eCommerce functionality (including product pages and secure checkout) to your blog or website. It’s fully responsive and looks nice both on desktops and mobile screens. You are able to customize it to match your brand appearance. With “Buy button” you can sell products on WordPress, Tumblr, Joomla, Drupal, Wix and Weebly, on the own website or anywhere else. You will be surprised, but you can also add the “Buy button” feature to Squarespace! If we compare Squarespace vs Shopify in the area of SSL certificates, Shopify here is the absolute winner. Shopify provides Free SSL certificates (even on non-commerce pages) within all plans. It means that every single page of your website is protected. In Squarespace, SSL is provided to its eCommerce pages only and doesn’t allow you to install custom certificates for other pages of your website. Of course, it’s good that credit card transactions on Squarespace are secured, but it would be better if all the other pages were also protected by SSL. Another important reason of having SSL installed on the whole site is that Google perceives it as a positive signal when ranking your site in search. So, now it’s clear why Shopify is leading here. If you need a platform with professional reporting functionality, Shopify is a much better option than Squarespace. In Squarespace you will see simple but effective overview of website visitors, traffic sources and sales. Shopify analytics will offer you more extensive data and detailed statistics, which include sales, finances, customers, acquisition and behavior reports. In addition, Shopify allows you to create your custom reports. Squarespace vs Shopify. Who is the winner of the battle? Both Squarespace and Shopify allow you to create a stunning website easily. Whatever your choice, you’ll get powerful eCommerce features and beautiful responsive templates. Deciding on which platform to start really depends on what type of website you want to run. The key difference between Squarespace and Shopify is that Shopify is more comprehensive and functional when it comes to eCommerce, because it is completely eCommerce-oriented. So, if you aim is to create an advanced web store with professional analytics - Shopify is the excellent choice for you. If you are planning to showcase the content of your website, like beautiful portfolio or blog, and sell couple of products - Squarespace is your perfect match. If you already using Squarespace, and want to power your store and make it more functional, without starting from a scratch, you can migrate Squarespace to Shopify. Until recently, there wasn’t a way to move your Squarespace store to Shopify or even export Squarespace products. Luckily, Cart2Cart launched automated Squarespace migration and now you are able to transfer all your eCommerce data to Shopify within couple of hours. Cart2Cart is the world’s leading shopping cart migration tool. It enables you to move your Squarespace data to 75+ eCommerce platforms with no programing skills and manual data input. Cart2Cart service will transfer your products, orders, customers, images and other related data automatically. How to migrate from Squarespace to Shopify? Register a Cart2Cart account or sign up with your Facebook or Google+ account. Choose the entities you want to migrate from Squarespace to Shopify. Perform the Free Demo migration and a limited number of entities will be moved to your live Shopify store within 30 min. Launch Full-scale data migration by clicking on “Start migration” button. Data transfer will start immediately. ECommerce data migration will take few hours, it will not affect your current Squarespace store performance. Customers will be able to make purchases during whole process of data transfer to Shopify. Start up growing an advanced store with Shopify right now! Free Demo migration from Squarespace to Shopify is available. Get your new store in few clicks!